Beautiful baptismal set for boyish baptism in very nice pastel colors. 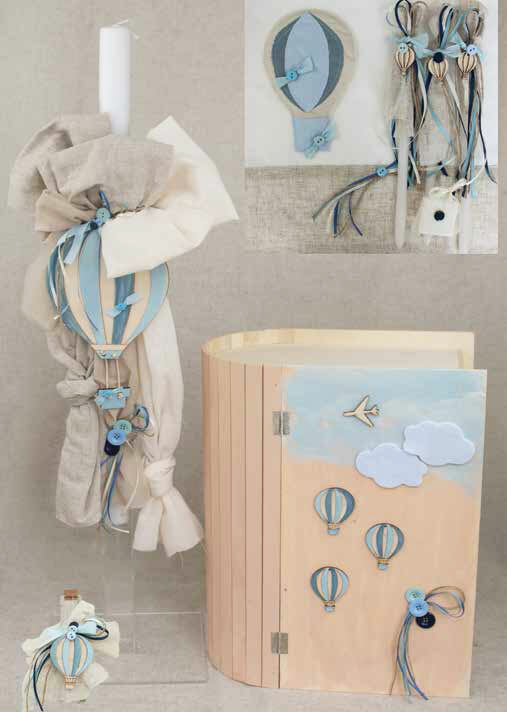 Decorated with a large wooden hot air balloon tied with a rich burlap of gray and white on the candle and many other smaller textiles or painted on the bottle of oil, the candles in the towel and the wooden box that accompanies the whole set. The set includes: candle, suitcase, three candles, soap, bottle of oil, laurel, underwear and towels. https://www.preciousandpretty.com/2018/07/hot-air-balloon-greek-baptism-lampada.html Greek Wedding Favors|Orthodox Crowns|Stefana|Baptism Invitations Hot air balloon greek baptism lampada set E806 Baptism set with hot air balloon theme, in pastel colors. Product #: Greek Wedding Favors|Orthodox Crowns|Stefana|Baptism Invitations_8860777612266926701 5 stars out of 5 reviews.